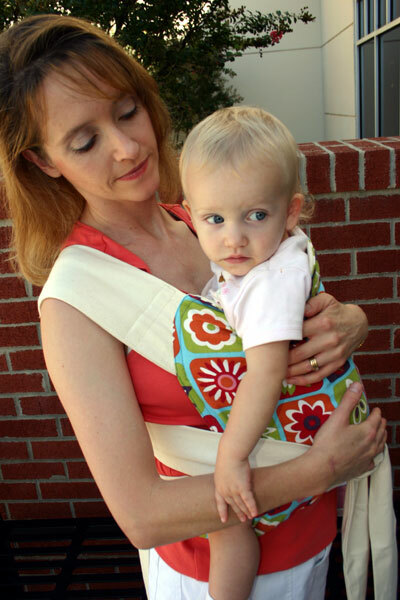 The Kozy Carrier makes babywearing easy. Designed and owned by work at home mom Kelley Mason, the Kozy Carrier is a modern version of the Asian Mei Tai, otherwise known as an Asian Baby Carrier (ABC). With wide padded shoulder straps, a padded curved head support, and sturdy durable fabrics (which give the body the stability it needs to carry heavier weights comfortably), the Kozy was designed for the comfort of not only you but your child as well. And with its generous sized body, it not only supports your child throughout their legs, bum and back, but it is made to grow with your child. It can be used from birth through toddlerhood and beyond . . . making the Kozy GREAT value. With the Kozy you can wear your little one on your back, on your front facing in or out, or even on your hip. You can even breastfeed bubba in the Kozy in the front facing in position. And because of its versatility, the Kozy can be worn comfortably when pregnant. The 'simplicity' of the Kozy is what allows it to be so versatile. It will fit a huge range of body types and sizes and can be worn with a baby from the day they are born till well into their toddler years!! All Kozy's have a secret pocket included on the end of one of the straps, big enough to hold credit cards or money. The Kozy can also be worn reversible and is available with a Pocket on the front panel to hold your wallet, keys and a spare nappy! All Kozy carriers are REVERSABLE to a solid colour so even dad won't mind toting baby around in a fabulous printed Kozy Mei Tai. He can just wear the opposite solid colour (available in black or natural). Just one more reason why parents love their Kozy carrier! With the highest quality, sturdy fabric and attention to detail in the sewing room, it's easy to see why the Kozy is a favorite baby carrier. Click the button below to add the Kozy Carrier to your wish list.